He planned his happiness. He made a concerted effort towards cheerfulness, with calendars and lists and diagrams. He exercised to exorcise. He watched movies guaranteed to have happy endings. The art he saw: joyful. The music he sought: celebratory. The novels he read: short and sweet. He chased sunshine. But there was that damning space in between, when the gears didn’t catch, when the engine ground to a halt. She dripped into those crevices and widened them, acid rain in the machine, rust on the steel. Then he’d be reminded of how he wasn’t enough. Not enough intellect, not enough humor, not enough money. He hadn’t known that he was being tested when she brought her father over to meet him. Her father had shaken his hand and then grabbed his pinky and thumb, holding the palm upright, exposing it like a violent fortune teller. You’ve never worked, he said, you’ve never had difficulty in your life. He looked around his apartment, his studio, a space he had been proud of up until that moment. His girlfriend, her father and he drank out of three different jam jars with leftover label glue. He saw his threadbare furniture and dust bunnies gorging themselves in the right angles where the floors met the walls. He couldn’t remember what he had seen before in his space, but it hadn’t been this. Now he wished no one had come. Not her father. Not her. After the visit, he cleaned his apartment, his hands and knees rubbed red from overwork and contact with chemicals, but she wasn’t impressed, didn’t comment, wouldn’t see. Perhaps his place wasn’t as filthy as he thought. Perhaps it was something else, something inside him. He tried to counter the ways he thought he failed her, breaking down aspects of his own personality and holding them up to the light, unsure which parts of himself weren’t right in the latticework of their connection. He worked to hide those parts nonetheless, wanting to make the feeling that he was an interchangeable part of her multi-faceted existence go away. He felt like he was playing a high stakes card game he hadn’t learned the rules to play properly. His salvos against the towering wall being built between them – the flowers, the conversational gambits, the handwritten cards that laid his soul bare – did nothing to combat the glaze that coated her eyes when they were together. His presence became secondary to looking at the world of her phone. Then, without warning, like she had just realized she had been dealt a bum hand, she folded the relationship, ready to be shuffled into a pair with someone else. The next time he went to the beach, he forgot his sunblock. Stuck in his self-imposed widening crevasse, he decided he deserved it. It was possible he had spent too long looking at himself as a series of disconnected parts, and now he didn’t like seeing the whole. So the change was welcome. He felt himself bake. He was dough turning to bread turning to stone. He knew he couldn’t go back to his apartment, which was already gaining back the grime and dirt and dust that he had so painstakingly removed. The world was hell bent on entropy, he decided. Maybe if he stayed in the sun long enough, he would evaporate. The loss would be lost to the machinations of UV light. A few meters down the beach, discarded on the sand, a loud green plastic child’s sand shovel called to him. He went to pick it up, considered it, then started digging. He removed dry sand to find the dark, wet underbelly, bruising the beach with his handiwork. It wasn’t enough just to dig. He wanted to create something. He dug a spiral shape. It started small and grew like a fungus from a nature show, a sped up video that had been captured over hours, a drunkard’s progress at first, huge but wobbly. He stopped and regarded the design, panting. It wasn’t precise. He wanted a snail’s shell, a vortex, a black hole. He went back to work. His consciousness melted away like candle wax from a dollar store votive, but nothing replaced it. None of the usual desperation. A blanket of nothing. The cold ocean licked at his skin then assaulted it after the sun went down. The sand absorbed the night’s cold and he couldn’t feel his toes. He kept shaping the spiral, the moonlight a fine replacement for sunshine. The blood that now dripped freely from his hands turned the spiral and the child’s shovel a brackish black. Suddenly, a yellow light. The extra illumination felt like something that came from within. He was vibrating from hypothermic cold that, in his state, was easy to mistake for a euphoric excitement. But no, it came from above. It was briefly warm, like the stifling stale air of a summer subway platform oozing around him, and when it snapped away like a bully’s wet gym towel, he let out a yelp of dismay and turned around. It was a ship. Metallic and thrumming. Hovering four stories above the water. It felt sentient, its light reading him, then his spiral. He was in awe; perhaps this was what the ancients felt during their rituals. Here was his answer, the filling to his emptiness. And with clarity he realized he had called it down towards himself, his green-shoveled spiral a beacon. If they wanted someone with an ever widening spiral for a soul, they could have him: he threw up his hands in cheerful welcome. 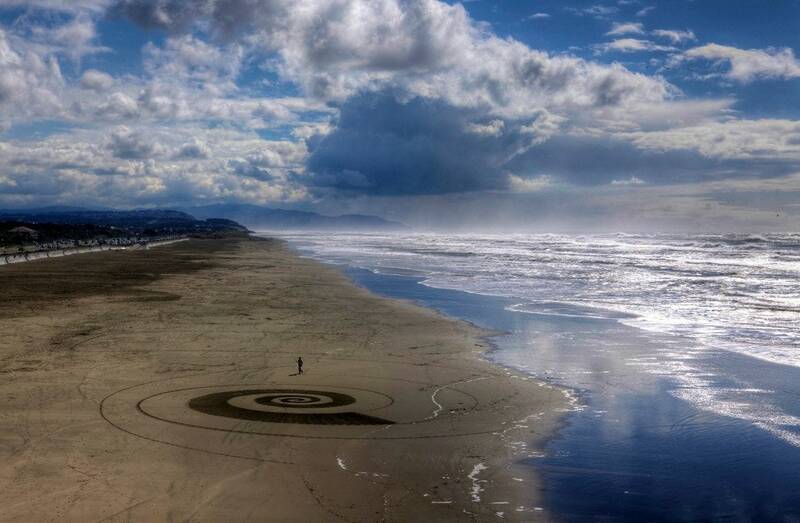 Despite tides and the ephemeral nature of sand and the constant sturm and drang of crowds, despite government programs and scientists and conservation efforts, the spiral remained. When the girl saw the spiral, she didn’t know it had been him that created it. She thought of him though, and wondered where he had gotten himself. His hands had been so nice and soft to hold. Posted on Monday November 2nd, 2015 Monday November 2nd, 2015 by Max Elman. This entry was posted in Photos & Stories and tagged beach, ocean, sand, water. Bookmark the permalink.